Last night I hosted our Jane Austen Book Club. Three founding members invited three friends (one apiece) to get together and talk about Jane Austen’s six novels. Pretty simple – six novels, six people, six nights. Thanks for my invitation, Kassidy. Instead of making more excuses and defending our status as conscientious readers – for everything but Jane Austen – I thought I would share the menu for the night. Last summer, I made oodles and oodles of pesto which I froze, and I already had several kinds of cheese in the fridge, so I decided we’d start with little bruschetta/ crostini thingies. If it sounds SO easy, you're right. It is. I got a baguette and sliced it into thin, round pieces of toast. I drizzled olive oil on the bottom of each of the breads. I spread either marinara or pesto or goat cheese or some combination of the three on all of them. 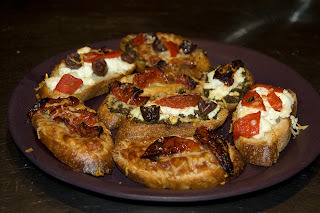 Then, I topped them either sliced roasted red peppers, sundried tomatoes, parmesan or kalamata olives. I put them in the oven right at 350 degrees when people started walking through the door and we ate them straight from the oven after about ten minutes. I thought I would mention that even though I don’t exactly double the recipe, I usually add extra of whatever I like to ensure I can make two pans of it. It tastes great right out of the oven or reheated for several days afterward (I live alone – my favorite dishes always end up lasting me a few days). So, to ensure it fills two pans, I use an eggplant that is 1 ½ pounds, extra mushrooms, tons and tons of bread crumbs, twice as much cheese, and extra onions. 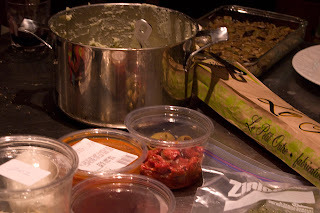 Also, I mix chives in the mashed potatoes, and I usually toss in extra potatoes as well. Since I was entertaining and I understand not everyone is a vegetarian, I conceded to a request for BACON. It’s been about eight years since I’ve eaten bacon, and the smell actually (don’t tell anyone) still makes my mouth water. Despite my bacon-yearning, I did not try the bacon pie. But, I will mention that the feedback on the bacon was that you couldn’t really taste it; the base layer is so flavorful that the bacon simply adds a little extra salty taste. So, if you want to keep your meat eaters happy, I recommend serving a steak on the side. Skip the bacon. Lastly, dessert was homemade vanilla ice cream with mint oreo crumbles. Erik gave me the ice cream maker attachment that goes with my mixer for Christmas, and I am so pleased with how this second batch of ice cream turned out. I’ve heard that some people haven’t had good results, but if you put the attachment in the freezer for the fifteen hours that the book recommends, the ice cream has a nice soft-serve consistency and isn’t soupy at all. Plus, you have to let it set up in the freezer after it’s mixed. If you want to serve ice cream, or just have some yourself, be sure to plan ahead! And of course, the piece de resistance of every meal was good wine and good conversation. Thanks, gals! It's after midnight, and I'm having serious hunger pangs...the picture of those yummy crostini is definitely not helping!!! I think I'm drooling:)I'll have to try the Shepherd's Pie recipe. I'm attempting to go meat-free atleast a couple of days a week, and it seems like something even my carnivore of a hubby would like.